TV Staging Giving You "Expert Phobia"? With Canada Day and Indpendence Day holidays it was hard to figure out what day to send this month's newsletter out. 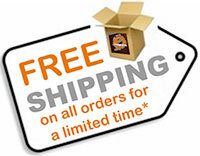 I didn't want to wait another minute because I don't want you to miss the Free Shipping offer that's on now. Plus you'll want to know about two important dates in the weeks ahead. In this month's newsletter you'll meet 8 home stagers, see my two fave home staging portfolio shots for July (could yours be next? ), learn why you don't need to have all the answers the way stagers appear to on TV, watch a video of me staging a home, and learn the 5 common home staging business traps you'll want to avoid. 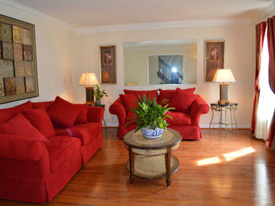 By the way, if you're in South Carolina, I have the perfrect home staging job for you. President, Voice of Possibility™ Group Inc.
"Independence" isn't just something to celebrate every 4th of July. So many of my Staging Diva students get into staging to finally have the creative and financial indepence they've craved for years. One of them, Kelly D'Lima in Arizona actually celebrated Independence Day by quitting her job when she realized she could make more in 5 hours of staging than she used to make in a whole week of working full-time. Use Coupon Code FreeShip13 when placing your order. To give you an extra jump on your own independence, you can have the entire Staging Diva Home Staging Training Program mailed to your door and I'll pick up the cost of shipping (no matter where you live). Simply place your order by midnight July 10 and enter coupon code FreeShip13 on the order form. When you hit "apply coupon," you'll see that your shipping is Free! > Take advantage of f'ree shipping before it expires July 10. TV Home Staging Giving You "Expert Phobia"? It's hard not to worry that you have to be an instant "expert" as soon as you start your home staging business. Especially when you watch TV and see the "pros" bark out orders and decisions without a moment's hesitation. In this video clip you'll see what I looked like staging a house on TV and then I share what's really going on behind the scenes. > Read why this isn't as scary as you think. I love to feature the work of Staging Diva Graduates. Here are two of my favorite home staging portfolio shots for July. Staging Diva Graduate Red Barrineuvo of Toronto's Redesign4More. Staging Diva Graduate Shelly Hughes of Staging Buzz LLC in Pennsylvania. > If you'd like to see one of your projects featured and get some f'ree publicity for your home staging business, don't forget to Share Your Staging Story with me so I can write about you! > Wondering how to get excellent home staging portfolio shots? Times indicated are eastern (NY time). Please adjust for your time zone. You'll learn how to avoid following the faulty business formula that most home stagers fall into. For beginner and established home stagers. You don't need to be our student. Ask me questions and get semi-private coaching in a small group for only $47. You're guaranteed to make $500 when you implement the ideas from our conversation. 1. Offering Free Home Staging "Estimates"
You can make more in a single home staging consultation than many people earn in an entire week when you do it right. I never go to a client's house unless they've already agreed to pay my home staging consultation fee. I'm able to avoid doing f'ree home staging estimates by following a script I use over the phone when a prospective client calls me. Staged homes do tend to sell faster and for more money, but that doesn't mean you should guarantee a specific result. There are too many other factors, beyond your control. Like the selling price they choose and how well the real estate agent markets the property. While this may be what you're looking at, never refer to their posessions as "junk" or "clutter." Instead you can say something like, "I can see that this room is very important to you and that you use it a lot. Now that you're putting your home on the real estate market..."
> Read the rest of this story here. Join me this month in welcoming these 4 new and returning Staging Diva Grads to the Staging Diva Directory of Home Stagers. Check out their profiles and get inspired. "The Staging Diva Directory of Home Stagers is always one of the top 3 sources of traffic to my own website." 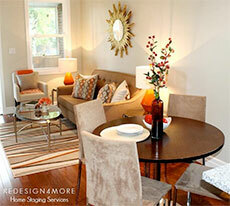 > Read more about Donna's home staging success. You can add these Social Media icons to your Directory Profile. FREE with an annual listing. Did you know that I'll personally design a company brochure for you based on your listing in the Staging Diva Directory of Home Stagers? And it's totally FREE when you join with a Profile Listing and commit for a year. "Recently I became part of The Staging Diva Directory of Home Stagers. Debra designed my brochure which has been a great marketing tool. I was in awe at how stunning my brochure looked. I contacted real estate agents that I am working with and asked if I could include my brochure and business card with their monthly newsletters. After many yes’s I visited my printer and had him print 500 copies, Debra, they looked amazing printed. This little marketing exercise has generated some great leads and strengthened my business. I just finished a project where I made $1452. Not only am I following my passion and love of decor, but having an amazing and fun time doing this. Thank you Debra for helping me succeed with your great training, tools and amazing advice." > Learn how you can join and get your company brochure too. Debra Gould has been a serial entrepreneur since 1989. She is president of Voice of Possibility Group Inc. with a mission of helping entrepreneurs create their ideal businesses and lifestyles. An internationally recognized home staging expert, Debra created the Staging Diva Home Staging Business Training Program with 7,000 students in the U.S., Canada and 20 other countries. She is the author of 5 guides, offers a Directory of Home Stagers to help home sellers and agents locate stagers in their area and is frequently profiled in the media. © 2013 Voice of Possibility Inc. All rights reserved. Content may not be duplicated without written permission. ® Staging Diva, Voice of Possibility and the Staging Diva logo are trademarks of Voice of Possibility Group Inc.